An aesthetically pleasing IPS wall panelling, which has been wrapped in BioClad® polyvinyl chloride (PVC) antimicrobial wall cladding. Pre-fabricated with no horizontal joints. Comes complete with built-in, hinged and lockable access panels. 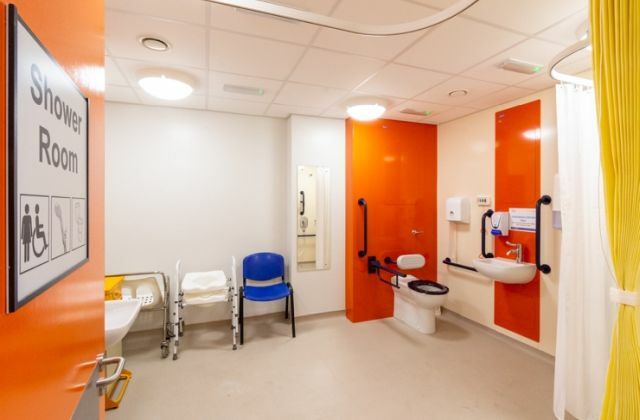 Designed to provide a streamlined, fully accessible and easy to maintain unit. Ultra-hygienic, offering high protection against bacterial growth. Supplied with a medium density fibreboard (MDF) site frame that consists of skirting, horizontal and vertical rails which slot and screw together, speeding up the installation process. Delivered pre-plumbed with HBN 10 compliant sanitaryware. BioClad® PVC antimicrobial wall cladding offers protection against bacterial growth - and is proven to reduce bacteria by up to 99.99% within two hours. Internal and external corners and returns are pre-formed to eliminate any need for mastic joints. Fully framed with a 2.5 mm panel overlap which is easy to clean, with no additional areas for bacteria or germs to colonize. Includes two lockable access panels, on projected hinges, pre-cut where applicable. Manufactured to suit ceiling heights of up to 3000 mm. Suited for use in bespoke specification to suit WC's, wash basins, showers and sluice units in commercial applications. Panels (w x d): 750 x 225 mm. Plinth, including vinyl flooring (h x w x d): 120 x 743 x 220 mm.